In this paper, we investigate the relay placement and power allocation for decode-and-forward (DF) cooperative relaying over correlated lognormal shadowed Rayleigh fading channels. Assuming that maximum-ratio combining is performed at the destination, we first derive an upper bound of symbol error rate (SER) with M-phase-shift keying (PSK) modulation. Then, three optimization problems are formulated to minimize the obtained SER upper bound, namely optimal relay placement with fixed power allocation, optimal power allocation with fixed relay location, and joint optimization of relay placement and power allocation. It is shown by the analytical results that the correlation coefficients and the standard deviations of shadowing have significant impacts on the optimal relay placement and power allocation. 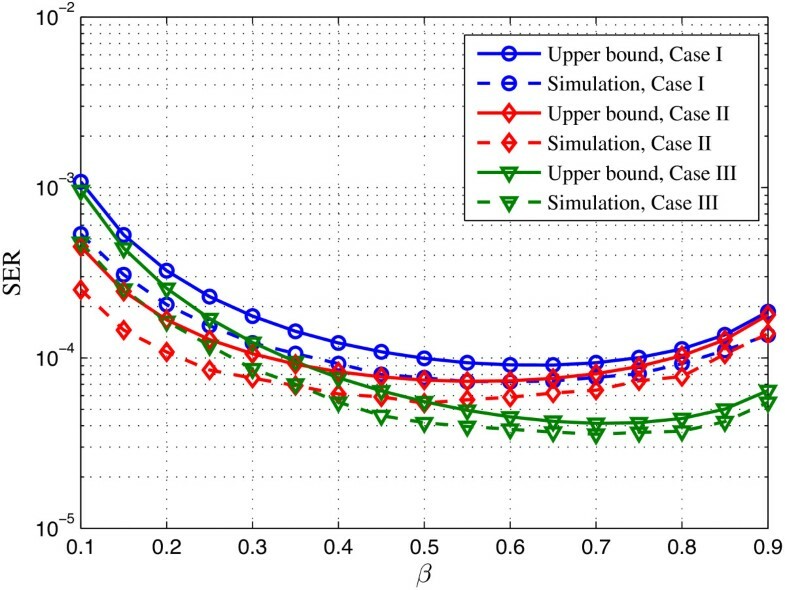 The simulation results validate our analysis and show that the SER upper bound is asymptotically tight in the high signal-to-noise ratio (SNR) regime. Recently, the concept of cooperative relaying has been adopted in next-generation mobile communication standards, such as WiMAX and LTE-Advanced [1, 2]. In these systems, fixed relays are deployed as intermediate nodes to forward data between mobile users and base stations (BS), thus improving the transmission reliability and extending the network coverage [3, 4]. Although the performance analysis and optimization for various cooperative relaying schemes, such as amplify-and-forward (AF) and decode-and-forward (DF), have been extensively studied (see, e.g., [3–8] and references therein), most of the current works are mainly limited to the cases that only consider the small-scale fading, e.g., Rayleigh, Rician, or Nakagami fading, and few works have worked on the cooperative relaying systems considering the large-scale fading. The large-scale fading, also known as shadowing, is caused by obstacles, e.g., buildings and hills, between the transmitter and receiver, and often modeled by a lognormal distribution. In realistic environments, the source, relay, and destination are distributed in different locations, and thus, the effects of shadowing between any two of them are more likely to be different and correlated, which has also been demonstrated by empirical measurements [9, 10]. In , the authors investigated the bit error rate of single-relay AF relaying over lognormal channels. The performance analysis of multi-hop AF cooperative relaying systems over lognormal channels was investigated in . In , the outage performance of DF relaying over correlated lognormal channels was investigated. However, these papers were limited to the channels of pure lognormal distribution, and they have not considered the composite fading channels which include small- and large-scale fadings (i.e., correlated shadowed fading channels). Our contribution in this paper can be briefly described as follows. First, we derive an upper bound of symbol error rate (SER) for DF cooperative relaying over correlated lognormal shadowed Rayleigh fading channels with M-phase-shift keying (PSK) modulation, which shows how the correlation coefficients and the standard deviations of shadowing impact the SER performance. Second, by minimizing the obtained SER upper bound, we formulate and compare three schemes to optimize the relay placement and power allocation. 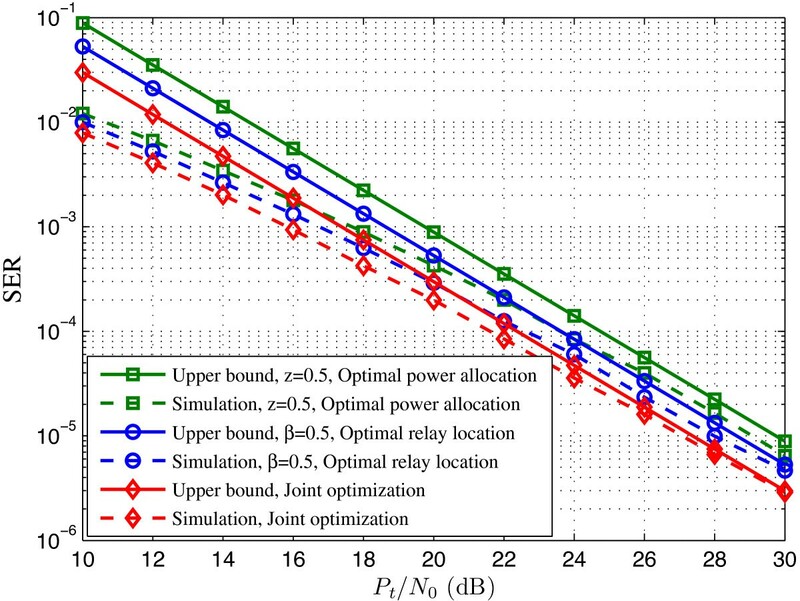 The simulation results show that joint optimization obtains the best SER performance and the SER upper bound is asymptotically tight in the high signal-to-noise ratio (SNR) regime. The rest of the paper is organized as follows. In Section 2, the system model is introduced. We derive the upper bound of SER in Section 3 and formulated three optimization problems with an aim to minimize the upper bound of SER in Section 4. Afterward, in Section 5, we present some numerical and simulation results to validate our analysis. Finally, Section 6 concludes this paper. Channel model for the three-node relay channel. with P ~ r being the transmit power at the relay. If the symbol is correctly decoded, P ~ r = P r ; otherwise, P ~ r = 0 . Here, lsr, lsd, and lrd denote the distances of the source-relay, source-destination, and relay-destination links, respectively; hsr, hsd, and hrd are the small-scale fading coefficients of the source-relay, source-destination, and relay-destination links, respectively, which are assumed to be independent and identically distributed (i.i.d.) zero-mean complex Gaussian random variables with unit variance; ξsr, ξsd, and ξrd capture the shadow fading effects of the source-relay, source-destination, and relay-destination links, respectively, which are assumed to be lognormal random variables , i.e., 10 log10(ξsr), 10 log10(ξsd), and 10 log10(ξrd) are Gaussian with zero mean and standard deviation σsr, σsd, and σrd, respectively; nsr, nsd, and nrd denote i.i.d. complex additive white Gaussian noise (AWGN) with zero mean and variance N0. The assumption of i.i.d. small-scale fading is reasonable since all nodes are separately deployed far away from each other. However, measurements in some practical mobile communication environments have shown that the lognormal shadowings are usually correlated . In general, there are two types of shadowing correlation. The first type of correlation, often referred to as auto-correlation, represents the correlation between two links with a common start node and different end nodes. Correspondingly, the second type of correlation, often referred to as cross-correlation, represents the correlation between two links with a common end node and different start nodes . As such, the shadowing between the source-destination and source-relay links is auto-correlated, and that between the source-destination and relay-destination links is cross-correlated. Denote the correlation coefficient between 10 log10(ξsd) and 10 log10(ξsr) as ρ1 and that between 10 log10(ξsd) and 10 log10(ξrd) as ρ2. Besides, the shadowing between the source-relay and relay-destination links is assumed to be uncorrelated, which has also been demonstrated in . γ = P s l sd - α ξ sd h sd 2 + P ~ r l rd - α ξ rd h rd 2 N 0 . P e γ = 1 π ∫ 0 M - 1 π / M exp - γ sin 2 π / M sin 2 θ d θ .
where γ sr = P s l sr - α ξ sr h sr 2 N 0 is the SNR at the relay node. Substituting (4) and (5) into (6), the SER conditioned on the channel coefficients can be obtained. Since the channel involves not only small-scale fading but also shadowing, we should average the conditional SER over the small-scale fading and shadowing. Φ x θ = 1 π ∫ 0 M - 1 π M 1 x θ d θ . A = 1 π ∫ 0 M - 1 π M sin 2 θ d θ = M - 1 2 M + sin 2 π M 4 π , B = 1 π ∫ 0 M - 1 π M sin 4 θ d θ = 3 M - 1 8 M + sin 2 π M 4 π - sin 4 π M 32 π .
P e , upper = N 0 2 sin 4 π M exp σ sd 2 2 η 2 × A 2 l sd α l sr α P s 2 exp σ sr 2 + 2 ρ 1 σ sd σ sr 2 η 2 + B l sd α l rd α P s P r exp σ rd 2 + 2 ρ 2 σ sd σ rd 2 η 2 . From (14), we can see that the SER upper bound is determined by not only the distances between these nodes but also the correlation coefficients and standard deviations of shadowing. G = N 0 P t l sd - α sin 2 π M 2 exp σ sd 2 2 η 2 . The optimization problem can be formulated for the following three cases. z ∗ = arg min z P e , upper subject to 0 < z < 1 . W = exp σ sr 2 + 2 ρ 1 σ sd σ sr - σ rd 2 - 2 ρ 2 σ sd σ rd 2 η 2 . ∂ 2 P e , upper ∂ z 2 = G α α - 1 A 2 z α - 2 β 2 exp σ sr 2 + 2 ρ 1 σ sd σ sr 2 η 2 + α α - 1 B 1 - z α - 2 β 1 - β exp σ rd 2 + 2 ρ 2 σ sd σ rd 2 η 2 . It is easy to see that ∂ 2 P e , upper ∂ z 2 > 0 for α > 1 and 0 < z < 1, which means the objective function is convex . Therefore, we conclude that the solution given in (18) is optimal to problem (17). From (18) and (19), it is observed that the optimal relay placement depends on the correlation coefficients and standard deviations of shadowing, the power allocation strategy, the path loss exponent, and the modulation schemes. When the auto-correlation coefficient or the standard deviation over source-to-relay increases, the relay should be placed more closely to the source. On the other hand, when the cross-correlation coefficient or the standard deviation over relay-to-destination increases, the relay should be placed more closely to the destination. Since a larger correlation coefficient or standard deviation of shadowing means worse link quality, we conclude that the relay should be placed more closely to the node with a larger correlation coefficient and standard deviation of shadowing so as to compensate for the loss of the link quality. β ∗ = arg min β P e , upper subject to 0 < β < 1 .
β ∗ = 1 + 1 + 8 A 2 z α W B 1 - z α 3 + 1 + 8 A 2 z α W B 1 - z α . ∂ 2 P e , upper ∂ β 2 = G 6 A 2 z α β 4 exp σ sr 2 + 2 ρ 1 σ sd σ sr 2 η 2 + 2 B 3 β 2 - 3 β + 1 β 3 1 - β 3 1 - z - α exp σ rd 2 + 2 ρ 2 σ sd σ rd 2 η 2 . It can be seen that ∂ 2 P e , upper ∂ β 2 > 0 for 0 < β < 1. This implies that the objective function is convex and the solution given in (22) is optimal to problem (21). From (22), we observe that the correlation coefficients and standard deviations of shadowing and the relay placement have significant impacts on the optimal power allocation. As the auto-correlation coefficient or the standard deviation over the source-relay link increases, the power at the source should increase and the power at the relay should decrease. If the shadowing between source to relay is much more severe than that between relay to destination, i.e., σsr ≫ σrd, then P s goes to P t and P r goes to 0, which means that we should put the total power at the source and do not need to use the relay. As the standard deviation over the relay-destination link increases, the power at the source should decrease and the power at the relay should increase. If the shadowing between relay to destination is much more severe than that between source to relay, i.e., σsr ≪ σrd, then P s and P r both go to P t /2, which means that equal power allocation at the source and the relay should be adopted. β ∗ , z ∗ = arg min β , z P e , upper subject to 0 < β < 1 and 0 < z < 1 . ∂ P e , upper ∂z = G α A 2 z α - 1 β 2 exp σ sr 2 + 2 ρ 1 σ sd σ sr 2 η 2 - α B 1 - z α - 1 β 1 - β exp σ rd 2 + 2 ρ 2 σ sd σ rd 2 η 2 = 0 . 1 - z α - 2 z + 1 z α - 1 = A 2 W B . 2 β - 1 = z. It is difficult to obtain the closed-form expression for the above equations. However, we note that (27) is an equation with only one variable, and thus, the numerical solution for z can be obtained by using the root-finding algorithms such as the bisection method and Newton’s method . Thereafter, by substituting the obtained z∗ into (28), we obtain the optimal solution for β. From (28), it is observed that 0.5 < β∗< 1 since 0 < z < 1, which means that the equal power strategy is not optimal and more power should be allocated to the source node. In this section, we present some numerical and simulation results to validate our analysis. For simplicity, we normalize the distance between the source and the destination to unity, i.e., lsd = 1. The source and the relay use QPSK modulation for data transmission, and the path loss exponent α is set to 4. In Figure 2, we show the relationship between the relay placement and different standard deviations of shadowing, where the transmit power of the source and that of the relay are the same, i.e., β = 0.5. Moreover, the correlation coefficients ρ1 and ρ2 are set to 0.5, and P t /N0 is set to 25 dB. We investigate three cases. It is assumed that σsd = σsr = σrd = 6 dB in case I, σsd = σrd = 6 dB and σsr = 3 dB in case II, and σsd = σsr = 6 dB and σrd = 3 dB in case III. The optimal values of z∗ are given in Table 1. It is observed from Figure 2 that when the standard deviations over source-relay and relay-destination links are equal, the optimal relay placement is z∗ ≈ 0.55. As the standard deviation of shadowing over the source-relay link decreases, the optimal relay location should be closer to the destination node. On the other hand, as the standard deviation of shadowing over the relay-destination link decreases, the optimal relay location should be closer to the source node. SER performance versus the relay placement with different standard deviations of shadowing. β = 0.5, ρ1 = ρ2 = 0.5, and P t /N0 = 25 dB. Figure 3 shows the relationship between the relay power allocation and different standard deviations of shadowing, where the relay is located in the middle of the source and the destination, and other simulation parameters are the same as in Figure 2. The optimal values of β∗ are also given in Table 1. From Figure 3, we can observe that if the standard deviations over source-relay and relay-destination links are equal, the optimal power allocation factor is β∗ ≈ 0.6. As the standard deviation of shadowing over the relay-destination link decreases, we should put more power at the source. On the other hand, as the standard deviation of shadowing over the source-relay link decreases, we should put more power at the relay. SER performance versus the power allocation factor with different standard deviations of shadowing. z= 0.5, ρ1 = ρ2 = 0.5, and P t /N0 = 25 dB. Then, we consider a special case with σsd = 7 dB, σsr = 3 dB, σrd = 5 dB, ρ1 = 0.2, and ρ2 = 0.6. For this case, we can obtain the solution of (17) as z∗ = 0.65 for equal power allocation, the solution of (21) as β∗ = 0.55 for the relay locating in the middle of the source and the destination, and the solution of (24) as (β∗,z∗) = (0.895,0.79) for the joint optimization. 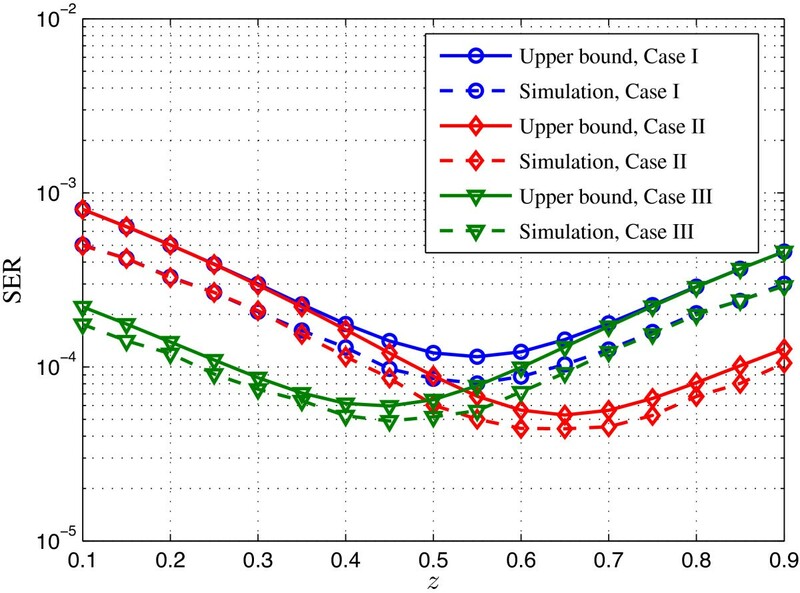 In Figure 4, we compare the SER performance for different optimization schemes. It is observed from Figure 4 that joint optimization outperforms the other two optimization schemes and achieves the minimum SER. Moreover, the gap between the simulation results and the SER upper bound gets smaller with the increase of SNR, which means that the SER upper bound is asymptotically tight in the high SNR regime. SER performance under different optimization schemes. σsd = 7 dB, σsr = 3 dB, σrd = 5 dB, ρ1 = 0.2, and ρ2 = 0.6. In this paper, we investigated the optimization of relay placement and power allocation by minimizing the SER upper bound for DF cooperative diversity over correlated lognormal shadowed Rayleigh fading channels. It was shown that the correlation coefficients and standard deviations of shadowing have significant impacts on the SER performance and hence on the optimal relay placement and power allocation. We compared three optimization schemes and showed that joint optimization obtains the best SER performance. Our method provided a scheme to determine the optimal relay placement and power allocation for next-generation wireless communication networks. g β , z = 1 - z α β 1 - β . ∇ 2 g β , z = 2 1 - z α 3 β 2 - 3 β + 1 β 3 1 - β 3 α 1 - z α - 1 1 - 2 β β 2 1 - β 2 α 1 - z α - 1 1 - 2 β β 2 1 - β 2 α α - 1 1 - z α - 2 β 1 - β .
det ∇ 2 g β , z = α 2 α - 6 β 2 + 6 - 2 α β + α - 2 1 - z 2 - 2 α β 4 1 - β 4 . It is easy to check that the above determinants are positive for α > 3, which means that the Hessian matrix of f (β,z) and g (β,z) are positive definite for α > 3. Therefore, the Hessian matrix of the objective function stated in (15) is positive definite for α > 3. This work was supported by the National Natural Science Foundation of China (61372097, 61271411).